Congratulations on your successful article here on The Huffington Post. I know how thrilling it must have been to watch those likes just climb and climb. Over a million likes! That's really amazing. And sadly, it's not surprising. 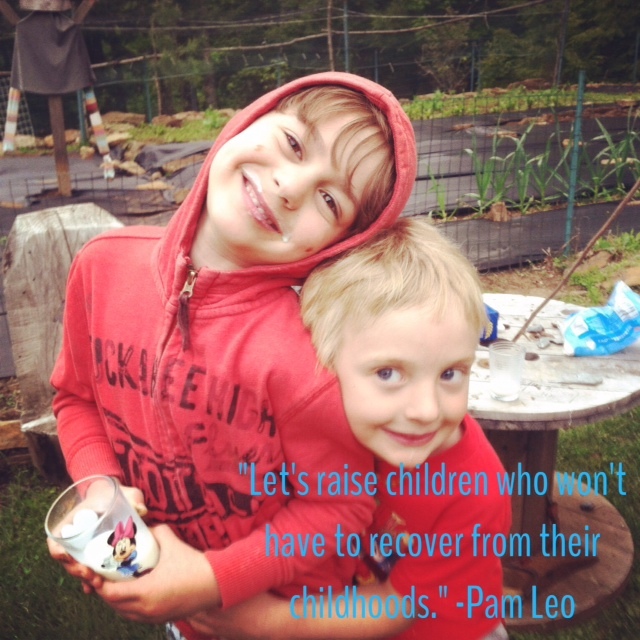 Adults, even those who are parents themselves, tend to resent children. I get it. I resent my child sometimes. He's so needy and emotional and prone to displaying that neediness and emotionality through seriously off-track and annoying behaviors. But luckily, I know why he acts this way -- his brain is immature. That's pretty much the whole answer. I don't need to know more about why he behaves the way he does. I only needed to learn that; A) It's not personal -- he's not acting that way to be a brat or "get me," and B) I can always choose how I behave in any given situation and be a model for how I'd like him to grow up and behave. Historically, it's only very recently that children have garnered the most basic of rights and protections. The abolishment of child labor in the U.S. is about 75 years-old. That sounds like a long time ago, but it isn't. Children are still the only cohort in this country unprotected from physical punishment. You can't hit your spouse, coworker or even an incarcerated felon, but you can hit a child -- and this is legal in public schools in 22 states. I hear your concerns, but we are really so far from being child-centered that the mere suggestion is laughable. 1. A fear of our children. Actually, I think what people fear (and you allude to it too), are children's big, messy, loud, emotional reactions. When Mom's "face whitens" and she runs to acquiesce to her child's demand for a different sippy cup, well, you and I agree that this is not the best response. However, your advice (of denying them, walking away, and ignoring) isn't helpful either. It doesn't teach the melting-down child anything other than, "When you have a big, overwhelming feeling, it is not OK with me." This leaves a child to deduce that there's no room for their feelings, bad days, growth spurts, separation anxiety or any of the other normal childhood stressors and worries that might build up over time only to come spilling out when the bowl is the wrong color. That's just normal. I'm not a neuroscientist, but there's research indicating that children are generally doing the best they can with what they've got, and will need A LOT of support in integrating the regulatory parts of their brains as they grow. I'm not suggesting that parents should not be in charge, I just don't think you have to be unfriendly about it. 2. A lowered bar. No. Just no. A lowered bar is not the problem here. You say, "When children misbehave, whether it's by way of public outburst or private surliness, parents are apt to shrug their shoulders as if to say, 'That's just the way it is with kids.'" That's one thing that could happen, but another thing is for a child to get a boatload of adult rage unloaded on them. They might get yelled at, or spanked, or publically shamed. And why is there no query here as to WHY a child is "misbehaving"? Why is a public outburst or private surliness not viewed as a symptom of a disconnected child? One in need of guidance and support? Or one who is just full-up in the emotions department and needing to dump? Let's raise the bar on connected, brain-based parenting responses that respect children and leave their dignity intact. Children are already expected to behave like little perfect adults too much as it is (while the adults around them lose their tempers and act like babies). Just no. 3. We've lost the village. Yes! A village would be fantastic. How about a village that supports new parents through the most disconcerting rite-of-passage we've got? We could really use some paid parental leave and family-friendly workplaces! How about a stipend toward high-quality child-care? Too expensive, you say? Well, drug rehab facilities and juvenile detention centers are expensive too. Unsupported parents are stressed-out, ineffective parents. Childless and don't want your tax dollars to go towards those who choose to procreate? Move somewhere where there are no children and see how awesome it is. Honestly, the last thing I need is some emotionally unintelligent person correcting or shaming my child -- that just makes more work for me. Offering appropriate structure and boundaries is a given. I don't expect my kid to be perfect, I just expect him to be kind, because we work hard to model that every single day. 4. A reliance on shortcuts. Let me temper your lack of understanding of the 24/7/365 nature of parenting and developmentally inappropriate expectations with a little dose of reality. When I see how wonderful it is that Caillou can entertain my child on a flight, I might be tempted to put it on when I am at a restaurant even though I know children must learn patience. Also -- I could be running on three hours of sleep and a quart of iced coffee, so judge not, fellow Mama. You never know the backstory of another family's struggles from across the restaurant. Of course they must learn to entertain themselves. But do you know any adults who never indulge in complaints when they are irritated, grumpy or bored? I don't. Try compassion and kindness for Pete's sake. Adulthood and a fully-developed brain are both hard-won after 20-plus years of neurological architecture. Back off the self-soothing, independence, "they've-got-to-learn-sometime" narrative just a bit. 5. Parents put their children's needs ahead of their own. This is definitely a problem for some. But telling parents to adopt a "too-bad-you'll-just-have-to-wait" approach is not a solution. I can never understand why the response to "too soft" parenting is to run straightaway to "too hard." Emotionally distant, authority-based parenting errs on the side of disconnection, relies on a fear response and is not good for kids. Laissez-faire, permissive parenting is problematic in its own right. Children need boundaries and limits and will feel scared and out-of-control if they are not enforced. 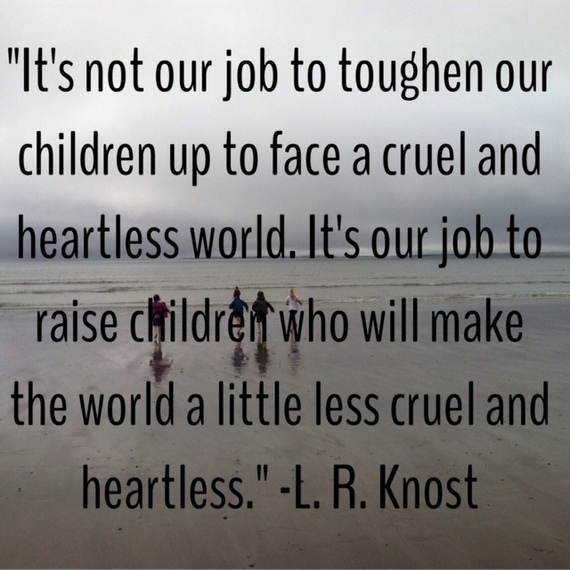 But limits enforced without compassion and understanding of the predictable upset are counter to a child's development. Why is there no "just right" option considered here? Why can't you say "No," and then turn toward your child instead of away? Why is there no understanding or acknowledgment? It is unreasonable to expect that a young child will cheerfully respond to your limit with a, "Thanks so much for that boundary, I'm all set now." They might actually have a feeling about it! In my two decades of working with children, they seem to integrate the boundary better when coached through the feeling instead of being ushered around it, or outright shut down. Children need to navigate the discomfort, fear, grief, disappointment and frustration that life will inevitably send their way. Loss is not optional here on earth -- it never has been. If kids are required to sit down, shut-up and obey, they will be just as woefully prepared for these same difficulties. If they have not been shown love and compassion in their most upset moments, they will not learn to offer this to themselves or others. They just will not. And that, more than anything in your article about how to properly raise a child, is what I fear. So please, parents and caregivers from San Francisco to Sheffield, and all over the world, ask for more support. Expect more from your community. Share your struggles with a friend. Lean on each other and model interdependence. Give more -- to your children AND yourself -- more compassion, more love, more relaxation, more kindness, more room to feel, more space for messiness. And let's straighten our culture out, together. This is a hostile environment for raising children and for families. Let's turn that around. Sarah helps families create strong relationships and peaceful homes through her online program, PEAK Parenting. Learn more at www.sarahmaclaughlin.com.